I was made to realize that I am responsible for letting the world know about my work. It is up to them to interact with it; if I do not share it, if I don’t put it out there, then no one even has a choice of whether or not they want to read it. Introducing my latest poetic journey, SAFFRON and SAGE. It is fascinating to find inside these pages poems that are inspiring. Some poems tell stories, some are long, some short, funny, sad, thoughtful . . We feel we are near a mind that is intelligent, sensitive, compassionate and wise. In this work, we find a blueprint of living with fine taste and wisdom. The span of the poetry is comprehensive. These poems celebrate life, love, people, spirit, peace, etc. The selections are as varied as the human experience. As you read them, we expect you to think, laugh, cry–question and see yourself and people you know. Read the poetry aloud to feel and see the heart and soul of the writer. ...if I do not share it, if I don’t put it out there, then no one even has a choice of whether or not they want to read it. Each poem was chosen for its beauty, timelessness and relation to the human experience. 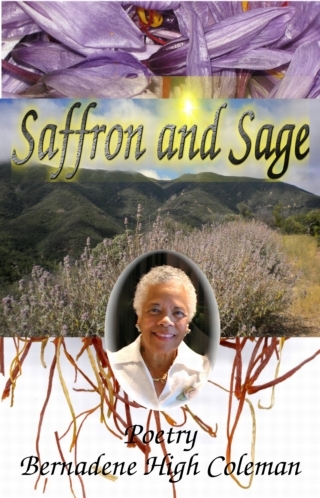 The ultimate goal of SAFFRON and SAGE is to stimulate the imagination and senses of the reader. These selections can be enjoyed by all; individuals or groups, and families alike.